The story summaries below were written sometime between 1993 and 1997. Trouble on the moon. Gunther (Bruce Willis if they ever film it) and frigid Russian ice-maiden (Brigitte Nielson) come together to solve the problems on a micro- and macro-level. Connie Willis. Even the Queen. Originally in : Isaac Asimov’s Science Fiction Magazine, April 1992. An extremely well written piece of storytelling, focussing on the relationships between and across generations of female members of a family. The biological issue in question, and the opportunity to have a choice in the matter, is the fulcrum upon which the story balances. 1993 Hugo, Best Short Story. L. Sprague de Camp. The Round-Eyed barbarians. Originally in : Amazing Stories, January 1992. The Chinese discover the Americas first. The protagonist repeatedly attempts to program himself into a supercomputer in an attempt to create a version of him which is unaware that it is not the real thing. Terry Bisson. Two Guys from the Future. Originally in : Omni, August 1992. Romantic comedy. Two guys from the future travel back to save works of art otherwise destined to be lost. Nancy Kress. The Mountain to Mohammed. Medical services become increasingly difficult for the underprivileged to obtain. Lateral thinking on their part helps to solve the problem. Ian Watson. The coming of Vertumnus. Originally in : Interzone, February 1992. Jill Donaldson, art critic, gets involved with some erotica of very dubious pedigree. Robert Silverberg. A long night’s vigil at the temple. Originally in : After the King (Tor). A man of the faith is confronted with evidence that the whole basis on which his faith is based is erroneous. Does he share this information or suppress it? The Gods of the faith are extra-terrestrials. Arthur C. Clarke. The Hammer of God. Originally in : Time, Fall 1992. Novel outline. Publication of which could only have been justified posthumously. Originally in : Isaac Asimov’s Science Fiction Magazine, June 1992. A world in which puberty arrives very, very suddenly and with all the trauma (physical, mental) of childbirth, and with one or two little quirks. 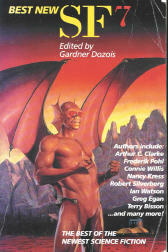 Originally in : The Magazine of Fantasy and Science Fiction, October/November 1992. Joe tries to exorcise ‘Nam ghosts again. There’s something very unpleasant in the jungle..
Steven Utley. The Glowing Cloud. Time traveller goes back to Martinique 1902 for the eruption of Mount Pelee. Originally in : Omni, November 1992. Particle accelerator creates a singularity, despite warnings from female scientist. Political prison camp in a future, fucked-up States. Neal Barrett Jr. The last cardinal bird in Tennessee. Trailer park family – foetus in a bottle, dad wired up to any amount of medical stuff keeping him half-alive, and two babes. Originally in : The Magazine of Fantasy and Science Fiction, June 1992. Six years ago every AI supercomputer took control of its own, and humanity’s destiny. On the anniversary of this event, computer-generated celebrations take place. Young woman confronts her absent father and her family trait. Jonathon Lethem, Lukas Jaeger. The Elvis National Theater of Okinawa. Cyberpunk, although as it is Elvis, perhaps Cyberrock’n’roll. Thang’you very much. Originally in : The Magazine of Fantasy and Science Fiction, July 1992. Sam Clemens rides with Quantrill in the American Civil War. Alternate History – bit difficult if you are British and not altogether sure of the key players and battlegrounds etc. Ian McDonald. The Best and the Rest of James Joyce. Originally in : Interzone April 1992. Kate Wilhelm. Naming the Flowers. Originally in : Axolotl Press, 1992. Best story in the collection. Bittersweet story of a young girl with a very mysterious background, who with the help of the protagonist manages at first to escape the CIA’s clutches. In the end she does finally, after a fashion, do so. John Lennon, like, but with him having left the Beatles long before they became the Fab Four. Groovy. Kathe Koja. By the Mirror of my Youth. Raymond is replacing his wife, Rachel, with a younger woman. A younger Rachel, in fact. But both versions fight back in their different ways. Frederik Pohl. Outnumbering the Dead. Rafiel is one of many chronologically aged, though still virile and youthful in appearance, in an overcrowded, near-immortal world. In a thoroughly vacuous, pretentious society, he finally leaves the planet when faced with his own mortality.